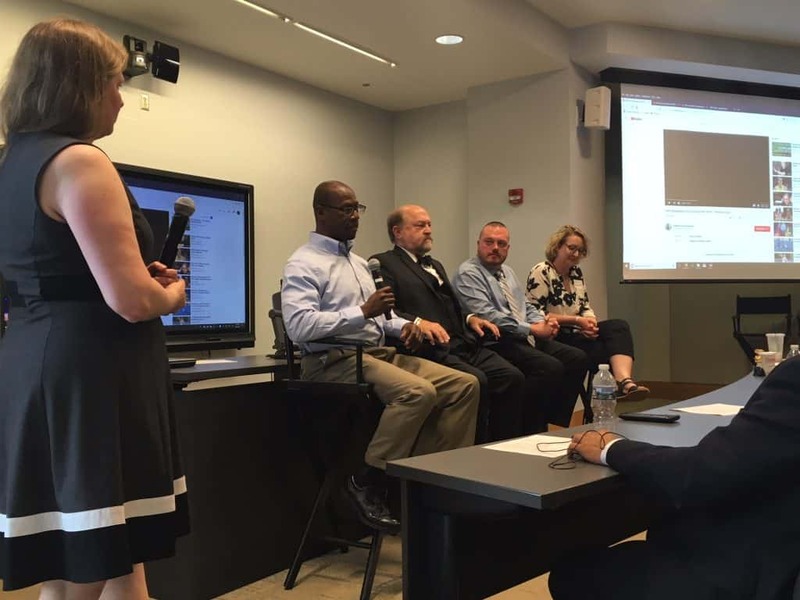 From left: Heather Brutz, Al Curtis, George Survant, Brandon Pasinski, and Emily Barrett at the Sustainable Fleet Management & Technologies Training on June 20. 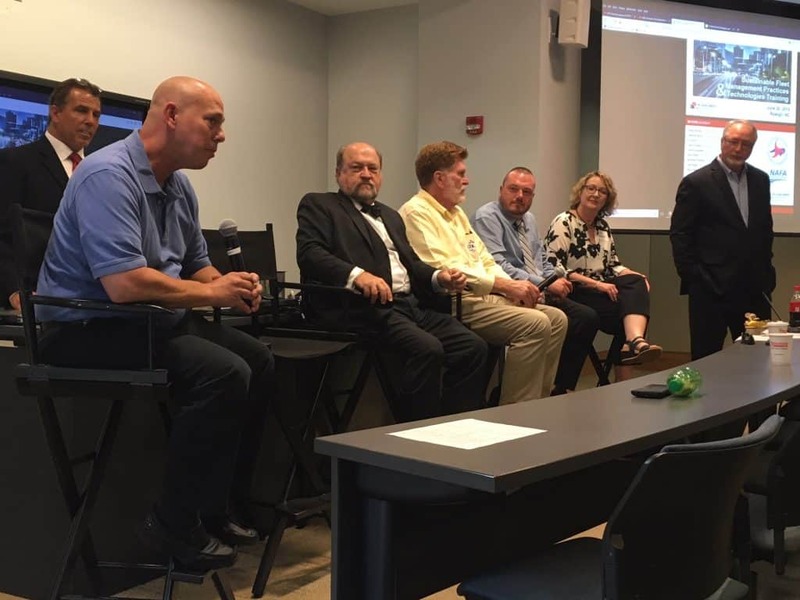 While experts at the Sustainable Fleet Management & Technologies Training came from a wide variety of backgrounds in fleet management, they shared a similar sentiment. 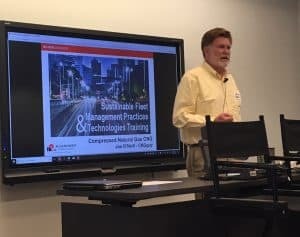 The June 20 training covered an assortment of topics involving all things fleets — including sustainability metrics, vehicle selection standards, life-cycle cost analysis, change management, electric/hybrid vehicles and charging, idle reduction technologies, CNG, LPG and biofuels. Rick Sapienza, of the NC Clean Energy Technology Center (NCCETC), estimated there was about 200 years of experience in the room. George Survant talks about fleet sustainability metrics. Presenters included Emily Barrett, Town of Cary NC Sustainability; Al Curtis, Cobb County GA Fleet Management; Chris Facente, University of NC Charlotte; Joe O’Neill, CNG Guy Consulting; Brandon Pasinski, Town of Cary NC Fleet Management; George Survant, National Truck Equipment Association (NTEA); and Michael Taylor, PERC; as well as Rick Sapienza, John Bonitz and Heather Brutz of the NCCETC. Whether a fleet uses electric, CNG, LPG, biofuels or a combination of those applications, some work better than others — it all depends on the individual fleets’ needs. “It isn’t one size fits all,” Sapienza said. 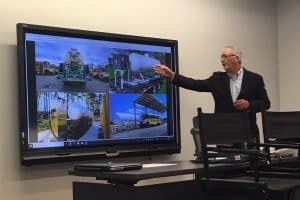 Survant, who discussed fleet sustainability metrics, said he encourages fleets to stay focused by regularly trying to come up with creative, innovative solutions. Emily Barrett and Brandon Pasinski of the Town of Cary. 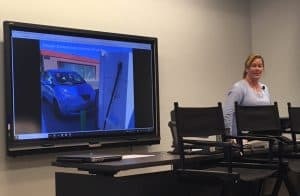 Barrett and Pasinski, who shared the Town of Cary’s sustainable fleet journey, advised utilizing the right vehicle for the job, using what you already have, and buying only what you need. The two also suggested driving correctly, limiting waste, spending time on maintenance, and planning your routes. Al Curtis discusses Change Management. 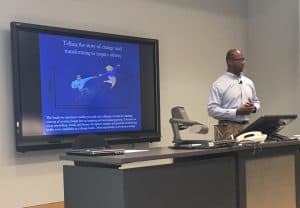 Curtis discussed change management, explaining that giving your team what they need to kick-start and accelerate change is of utmost importance. You can inspire and empower your team by offering ideas and using storytelling, and offering insights and practical methods, Curtis said. Cobb County started with CNG stations, then purchased Flex Fuel cars, propane vehicles, hybrid cars, and now has 29 Nissan Leafs, 4 Zero Cycles and 45 charging stations with 1 DC fast charger, Curtis said. “You must not just change, you must transform,” Curtis said. Lisa Poger discusses the value of electric vehicles. Poger talked about electric vehicles and their wide-range of benefits. Among them are fuel cost savings, lower maintenance, noise reduction and employee safety, exhaust/emissions reduction and more. Taylor showed how propane is widely used, increasing in its use both in the US and abroad, and how it can be utilized more in the future. Propane is also non-toxic, he said — if it’s spilled it would dissipate, and it can’t be blown up like gas can. 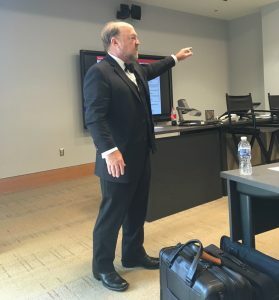 Joe O’Neill discussed the value of NVGs (Natural Gas Vehicles) — informing that natural gas supply is estimated to be large enough to meet the US energy needs for the next 100 years. NVG is also a cleaner burning fuel, he said, with greenhouse gas emissions reduced by 20 to 30 percent when compared to diesel and gasoline. NVGs are also at a lower cost per energy unit compared to diesel or gasoline. 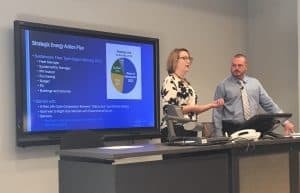 Brutz talked about creating a sustainable fleet plan, vehicles selection standards, and life-cycle cost analysis — which looks at all the costs associated with owning or leasing a vehicle to determine what the total cost of owning the vehicle is over its lifetime. Sustainable fleet goals should include emissions (environmental), energy (economic), and efficiency, Brutz said. The key components of a sustainable fleet plan are to commit to a process, set reduction targets, measure actions, and review and revise. When it comes to managing a sustainable fleet and making any kind of change — even with the right knowledge, ideas and equipment — standstills and setbacks are not uncommon. But the presenters agreed the future looks bright. From left: Chris Facente, George Survant, Joe O’Neill, Brandon Pasinski, Emily Barrett, and Michael Taylor.